This game is based on an example from the book Android Game Programming for Dummies that I made while reading the book and then improved a bit. The graphics will probably not work very well on low res devices (less than 480x800) but unless there is a huge demand for a low-res optimized deck then I will likely not address that problem. Each player gets 7 cards. An eight can always be played and the player is allowed to choose a new suit. 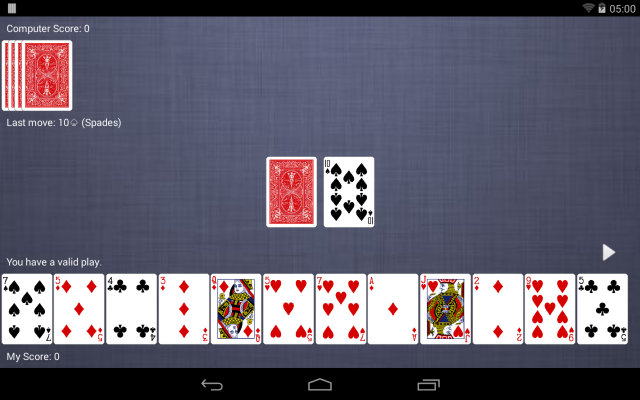 When no card can be played the player must draw cards until a playable card is drawn. The first player with an empty hand wins the hand and the winning score is calculated from the hand of the player that loses. The game ends when a player reaches 300 points.